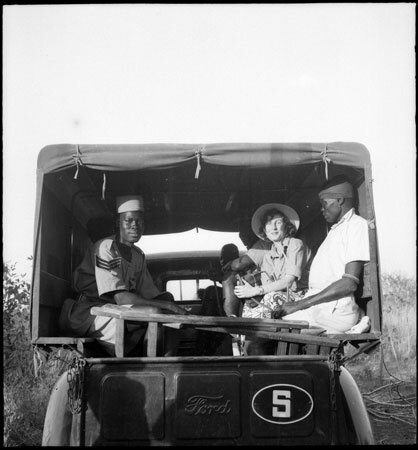 Jean Buxton with her sergeant minder, Makelele Nyayo, and another Mandari man, sitting in the back of a Ford Truck. In her hands is a water cannister. The photographer could well be Godfrey Lienhardt, Buxton's academic supervisor who visited her for a few weeks in the field. Morton, Chris. "Jean Buxton in truck" Southern Sudan Project (in development). 03 Jan. 2006. Pitt Rivers Museum. <http://southernsudan.prm.ox.ac.uk/details/1998.97.201/>.